Melting Ice In Greenland Could Expose Serious Pollutants From Buried Army Base : The Two-Way Camp Century was a research station and test site for deploying nuclear missiles before it was abandoned under the ice in the '60s. Scientists say pollutants left behind may spread as the ice melts. The camp was abandoned almost 50 years ago, completely buried below the surface. But serious pollutants were left behind. Now a team of scientists says that as climate warming melts the ice sheet, those pollutants could spread. 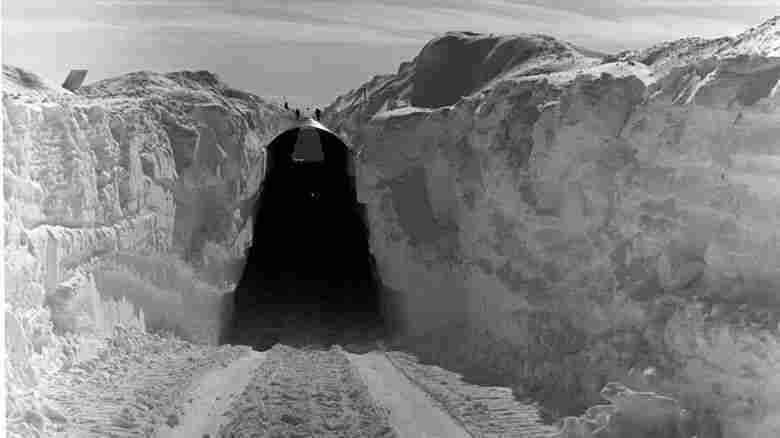 When the U.S. Army Corps of Engineers built Camp Century in 1959, an Army film touted it as an engineering marvel — a cavernous home dug into the ice sheet, big enough for up to 200 people. Some sections were more than 100 feet deep. "On the top of the world," the film's narrator intoned, "below the surface of a giant ice cap, a city is buried. Today on the island of Greenland, as part of man's continuing efforts to master the secrets of survival in the Arctic, the United States Army has established an unprecedented nuclear powered Arctic research center." Yes, there was research going on. But what the public did not know about was a secret effort there called Project Iceworm. Engineers built railways running along huge tunnels. 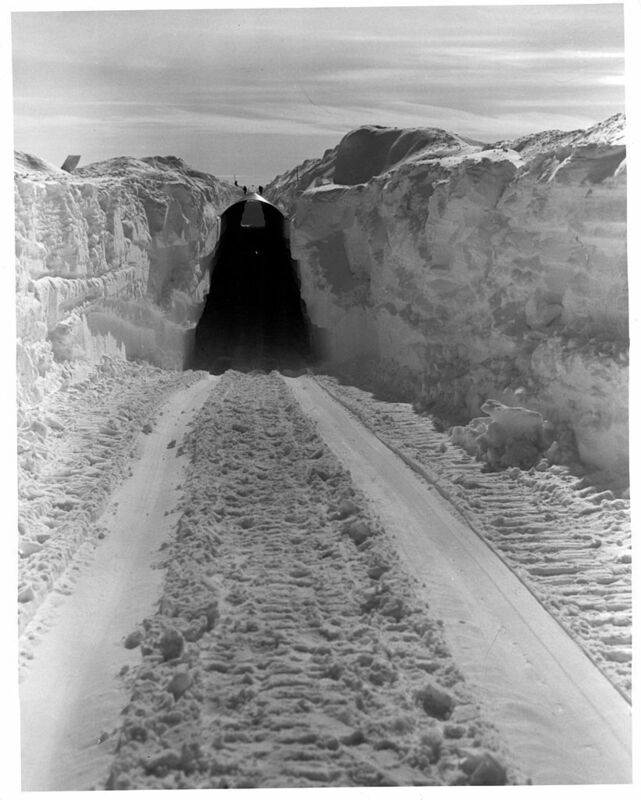 The plan was to test the idea of putting nuclear missiles on tracks below the ice, aimed at the Soviet Union. But the ice sheet began shifting. The Army realized that the tunnels wouldn't last, so they abandoned the camp in 1967. Ice and snow continued to accumulate, burying it even deeper. Five years ago, an arctic researcher in Greenland heard stories about the camp. "When you go to the site nowadays," William Colgan says, "it just looks like flat white. It looks like everywhere else on the ice sheet, but it's only when you start to understand what lies beneath the site that it takes on a special significance." Colgan is a physical geographer at York University in Canada. He found unclassified records that described what was left behind there — for example, the nuclear reactor was removed, but low-level radioactive cooling water used in it was not. The camp also stored lots of diesel fuel for generators and vehicles. There were very likely PCBs, which are toxic compounds in electrical equipment. And sumps dug into the snow stored human waste. There's no record of how much remained. Colgan says the Army figured all of it would be entombed forever. "They thought it would snow in perpetuity," he says, "and the phrase they used was that the waste would be preserved for eternity by perpetually accumulating snow." And in 1967, that was a good bet. Except now, the climate has changed. It's getting warmer. Greenland's ice sheet is melting. Colgan and a team of researchers estimated how soon the abandoned camp and its wastes might be uncovered. They published their findings in the journal Geophysical Research Letters. "So our study is saying, 'Well, we might not be looking at preservation for eternity any longer. It might be like preservation for the next century or so.' "
The climate computer models say the camp could be uncovered by the end of this century. Now, that's a worst-case scenario, based on an assumption that the world's governments won't do much to further reduce greenhouse gases that cause warming. But other things are happening that could spread that waste sooner. "As you continue to have longer warm periods," says Jennifer Mercer, "we will definitely start to see more cracks on the Greenland ice sheet." Mercer is an operations manager for scientific teams working on the ice sheet, such as the National Science Foundation. Most of the equipment is flown in, and knowing where cracks and crevasses are is critically important. Mercer says water from melting snow will find those cracks and crevasses. Once there, it could percolate down through what Arctic experts call "firn," the mix of snow and ice that makes up the sheet. The meltwater could easily end up in the buried camp and then carry contamination through under-ice channels to the ocean. The situation raises some interesting legal questions. Colgan says it's unclear who owns this waste. The Army built the camp under a treaty between the U.S. and Denmark, which had jurisdiction over Greenland. Jessica Green, an environmental policy expert at New York University, says it's a legal dilemma that's likely to start cropping up more often. "Climate change is raising a lot of questions about who's responsible for what. ... These are uncharted waters," she says. Green cites recent attempts by developing countries to force developed nations to pay for damage from extreme weather, based on the notion that developed countries created the warming problem. And it was recently reported that thawing permafrost in Siberia might have exposed strains of anthrax that now threaten people. Clearly, as the climate changes, finger-pointing and litigation won't be far behind.